On April 2, Maxwell hosted a public conversation on post-conflict reconstruction, featuring Deborah Alexander ’82 MSSc/’95 PhD (SSc), former senior policy advisor at the U.S. Department of State and a veteran of several conflict and stabilization missions, including, recently, Afghanistan. 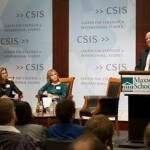 This event took place at the Center for Strategic and International Studies (CSIS) — the site of Maxwell’s striking new headquarters in Washington. For most alumni and friends, this was a first opportunity to visit Maxwell’s classrooms, offices, and other facilities at CSIS. 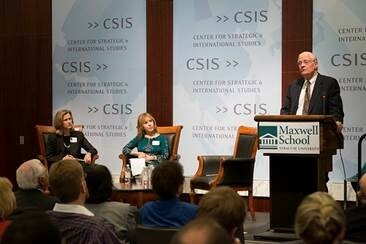 Alexander was joined in the conversation by Anthony H. Cordesman, Arleigh A. Burke Chair in Strategy at CSIS and frequent adviser to the U.S. State Department, Defense Department, and intelligence community; and Maxwell School PAIA professor Renée de Nevers. At the event, Deborah Alexander ’85 MSSc/’92 PhD(SSc) received the Maxwell School’s Spirit of Public Service Award on April 2 in Washington, DC. The award for distinguished public service honors individuals whose leadership in public life epitomizes the highest ideals of the Maxwell School of Citizenship and Public Affairs. Dr. Alexander served at the U.S. Department of State for 16 years, most recently as senior policy advisor, in a career that included assignments with USAID and the Department of Defense. She is a veteran of several conflict and stabilization missions — most recently in Afghanistan; her expertise includes post-conflict elections & governance, stabilization, women’s advancement, and civil-military relations. Dr. Alexander now serves as a senior subject matter expert & senior mentor with IDS International and the US Army’s Joint Regional Training Center and their National Training Center. She also works with Organization for Security and Co-operation in Europe on upcoming overseas elections.